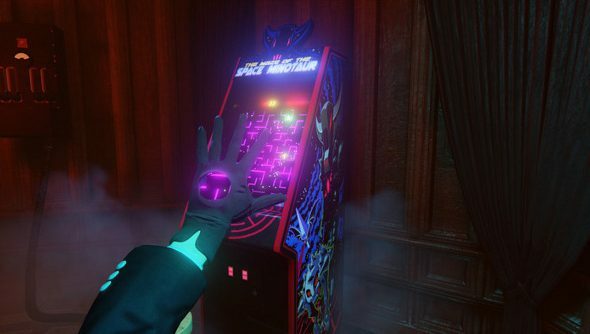 After Ken Levine decided to “wind down” Irrational Games, a bunch of BioShock and BioShock Infinite devs banded together to create Day For Night Games and their first project, The Black Glove. Announced earlier this year, The Black Glove sounded like a tantalising game, where players are called on to alter the pasts of three artists in attempt to improve their works in the future. Unsurprisingly, it’s ended up on Kickstarter. A strong pitch reveals more about the game, and I find my interest piqued even more, where experimentation, art and even arcade games have been squeezed together to create something utterly bizarre. As the new curator of the Equinox Theatre, a bizarre institution unstuck from time and space, the player must deal with three artists in residence, all who are struggling to create great works. Their problems are having an impact on the theatre, too, changing it in strange ways. By participating in “games of skill and chance” – like defeating the Space Minotaur, the game’s antagonist, in an old arcade game – that curator can interact with the artists’ pasts, altering the medium they work in, their muses and the message of the piece they are working in. Weird skeletal sculptures can be transformed into multi-media, unshielded x-ray art by fiddling with the medium, for instance. Critics then offer their thoughts on the works, which can provide hints about what still needs to be changed. But something that shouldn’t work, something that’s utterly crap, can still have worth. “[E]ven a wrong turn can produce interesting results in a ‘so-bad-it’s-good’ way,” the dev explains on the Kickstarter page. It all sounds a bit doolally. It’s not going to be cheap, either. The 16-person team’s been funding the game themselves, by taking on freelance work, but it still needs $550,000. Less than a day into the Kickstarter, almost $50K of that has been raised.